According to leaked documents obtained by GigaOm Facebook is set to release premium ads product on Feb 29th, Facebook is organizing Facebook Marketing Conference on Feb 29th in New York. Facebook is pitching that the new ads perform 40 to 80 percent better than their classic premium ads. Classic premium ads will be phased out starting Feb 29th, with this change Premium like, premium event, video comments and premium poll wonâ€™t be available. How these Upgraded Premium Ads work? Make a page post: There are 6 kinds of page posts to choose from: status updates (text), photos, videos, links, questions, and events. You can turn your page posts into ads, Anything you can post on your page can be turned into an ad. These ads can targeted to anyone on Facebook. When the person seeing your ad has friends who are fans of your page, Facebook will automatically expand the ad with enhanced social context about those friends, at no extra cost to you. When fans see your ad, theyâ€™ll see an expanded interface below the ad that lets them like or comment on the posts directly from the ad. 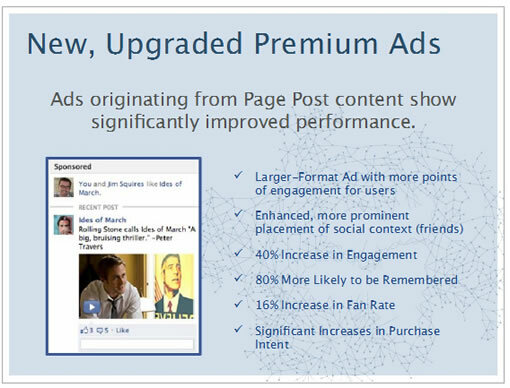 Facebook in the leaked document embedded below is pitching that new upgraded premium ads will increase user engagement to 40%, brand/ad retention to 80% and 16% increase in Fan rate.